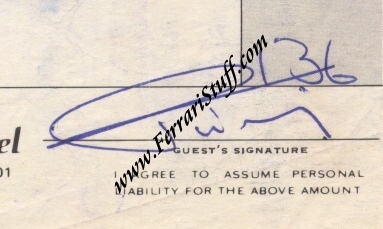 Didier Pironi signed hotel bill, Long Beach Grand Prix 1981. Here we have a truly unique Didier Pironi item from his time as a factory F1 driver for Scuderia Ferrari. 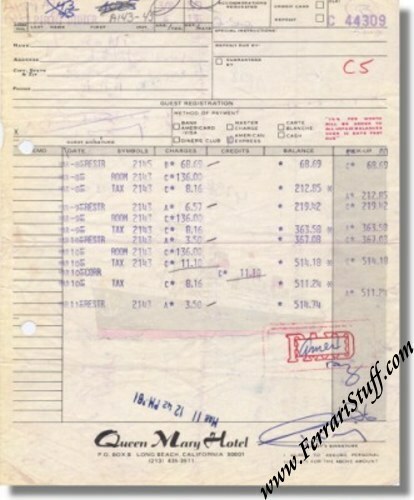 This is a bill from the Queen Mary Hotel in Long Beach, Califonia, where Didier resided in the days preceding the 1981 Long Beach Grand Prix. The bill shows intriguing details of Didier's stay there such as his spendings in the restaurant etc. The bill spans March 8 - 11, 1981 and Didier settled it using his American Express credit card. He also signed it at the bottom in blue ballpoint. According to this bill, Didier checked out on March 11, 12.42 P.M. The Long Beach Grand Prix took place on March 15 so it is very well possible that Didier stayed in this hotel at his own expense and changed hotels when the race team arrived for the race. About the race: Didier qualified the Ferrari 126 CK in 11th position, managed to set 8th fastest lap during the race but had to abandon in lap 67 (out of the total 80) with fuel system problems while in 7th place. His team mate, Gilles Villeneuve, already dropped out of the race in lap 17 with a broken halfshaft. Didier Pironi was born on March 26, 1952 in France and became a Scuderia Ferrari F1 driver in 1981. He crashed heavily during practice for the 1982 German Grand Prix, badly injuring both his legs of which he never regained full use. Didier was killed during a powerboat accident off the Isle of Wight on August 23, 1987.